(LWI) - On Sunday morning singing echoed in the corridors of the Camillian Center in Bangkok, Thailand: "Help me believe in what I could be and all that I am, Lord... show me the way one day at a time." Women delegates from The Lutheran World Federation (LWF) member churches in Asia were gathered for the Women in Church and Society (WICAS) meeting before the regional Pre-Assembly, taking place in Thailand's capital, 15-19 August. LWF churches in Asia have nominated delegates to participate in the Twelfth Assembly, which will be held in Windhoek, Namibia next year. Some are ordained pastors, others lay and all are active in the churches. LWF WICAS secretary Rev. Dr Elaine Neuenfeldt led the women’s meeting together with WICAS regional coordinators Ranjita Christie Borgoary from the United Evangelical Lutheran Churches of India and Nora Samosir, Protestant Christian Batak Church in Indonesia. The WICAS leaders presented the LWF Assembly to the delegates and explained their role there. They were also introduced to the work of the LWF Women on the Move program, which has four main themes: telling Herstories, implementing the LWF Gender Justice Policy, supporting women doing theology and strengthening the role of women in leadership. "We meet to speak out to the world that women need justice, in church and society," Borgoary said at the beginning of the meeting. She went on to explain the three important goals for WICAS, namely to make women’s work visible in the life of church and society; strengthen the network of women in the LWF; and explore the Assembly theme, "Liberated by God's Grace" from the perspective of women. I have learned about the important role of women in expressing the ideas that support other women and also support changes in the church and society. I feel better informed and the examples we were introduced to in the meeting were helpful for the issues we will discuss at the assembly next year. These goals can be achieved by collecting women's stories, so called Herstories, from all LWF regions and sharing them with the global communion, and by implementing the Gender Justice Policy. Borgoary said the "gender justice policy helps us to change our cultural practices," adding that time had come to change culture and bring equality. "There will be equality and there will be justice." She said the policy was a useful guide for the churches and encouraged the women delegates to introduce it in their local contexts and support the churches in drafting their own policy. One participant, Desri Maria Sumbayak from the Indonesian Christian Church, said this was the first time she was attending an LWF-organized WICAS meeting. "I have learned about the important role of women in expressing the ideas that support other women and also support changes in the church and society. I feel better informed and the examples we were introduced to in the meeting were helpful for the issues we will discuss at the assembly next year." As one of the advisors to the women's organization in her church, she said she felt enabled "to start to talk to them, visit them, share with them and listen. Hopefully we can also bring that to the Assembly. 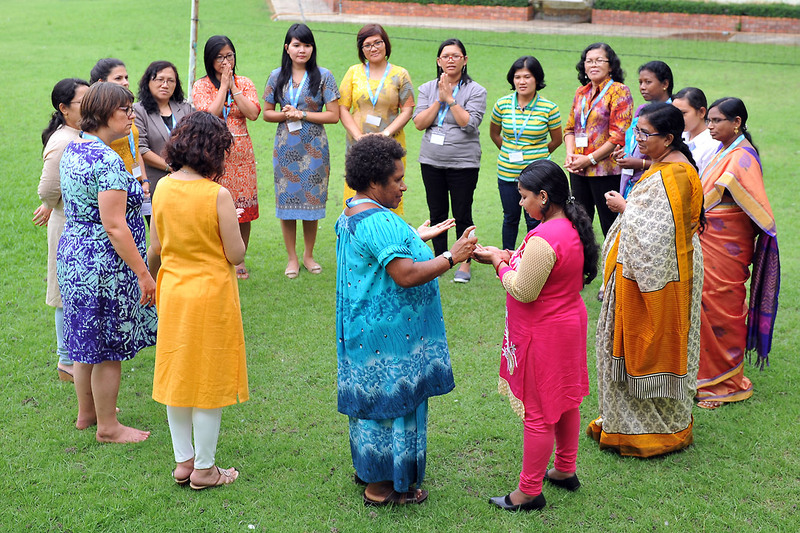 I feel this has also empowered me to approach the leadership of our church to advocate on behalf of women.” Sumbayak said she also learned about both similarities and differences from the experiences of other women in Asia.